Omega-3 Flax Farm | Linseed Oil for your well-being. ALA. alpha linolenic fatty acid, omega-3 is an essential fatty acid. “Essential” means it is a nutrient essential for human health and but cannot be made by the body so must consumed in the diet like vitamins and minerals. It is the parent omega-3 from which EPA and DHA are made in the body. ALA is so important for health that the body converts excess EPA and DHA back into ALA when required. Omega-3 is essential for normal growth and development of children. Flax Farm is a great way to get omega-3 into children. Either use our capsules of stir a little of the oil into their everyday meals; it tastes nice and mild. The love its creamy flavour in smoothies. ALA has been shown to help when taking 2 g per day. Omega-3 ALA contributes to normal blood cholesterol levels. The beneficial effect has been shown to be obtained with a daily intake of 2g ALA. It is easy to get this benefit from our linseed oil by using it in savoury and swet foods. Adding it to porridge, muesli or smoothies for breakfast is a popular way to get omega-3 into your diet. See our recipes for ideas. Flax Farm linseed oil is over 60% polyunsaturated. Replacing saturated fats with unsaturated fats in the diet has been shown to lower/reduce blood cholesterol. High cholesterol is a risk factor in the development of coronary heart disease. 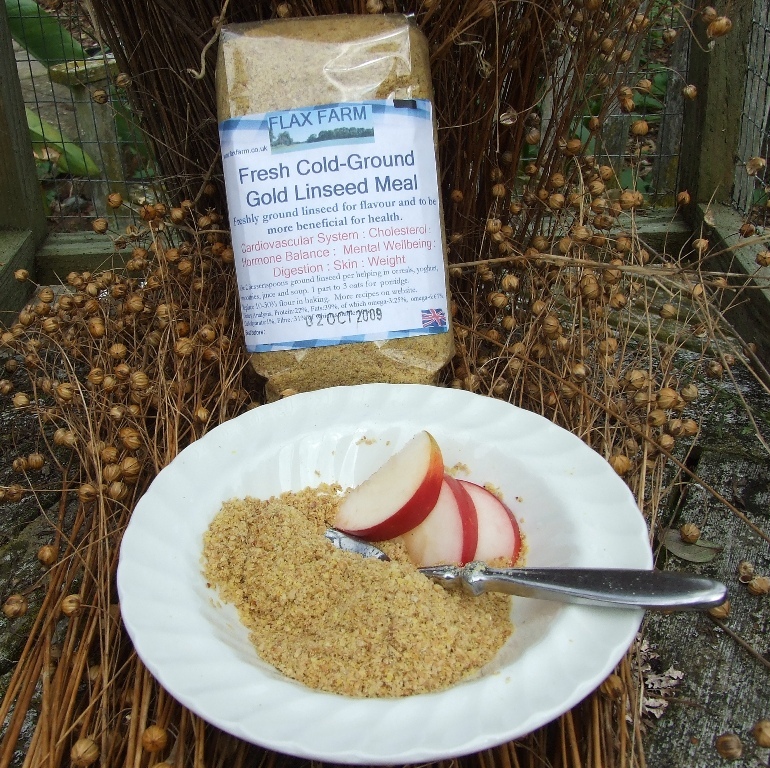 Its lovely mild taste makes Flax Farm cold-pressed linseed ideal for using instead of butter or cream in many dishes. We now prefer our cold-pressed linseed oil mixed with fat free yoghurt instead of cream and our linseed oil and banana ice cream is a year round favourite. See our recipes for ideas. There are three 18 carbon chain fatty acid molecules commonly found in our diets, Omega-3, 6 and 9. The 3, 6 and 9 refers to the position of the first double bond away from the acid end of the molecule. Omega-3 is a difficult compound to make in nature which is why it is a relatively rare nutrient; it is easier for plants to make omega-6 or 9 than omega-3. Animals can’t make omega-3 at all. This is why our food contains much more omega-6 and 9 and not enough omega-3. We don’t just need omega-3 and omega-6 in our diet; we need them in the correct balance. Omega-3 is a highly polyunsaturated fat, that found in linseed and is similar to the omega-3 associated with oily fish, fish oil and krill oil. Unfortunately in the west our diets are somewhat deficient in it. There are three kinds of omega-3 fatty acids: ALA (alpha linolenic acid), EPA (eicosapentaenoic acid) and DHA (docosahexaenoic acid). ALA is found in plant sources, it is metabolised into EPA and DHA in the body. In new research, including the Holism study scientists have shown that omega-3 from linseed (flaxseed) oil is more efficiently metabolised than previously thought . Our bodies need and use ALA, alpha-linolenic acid as a component of every cell in the body, it is particularly high in the brain, eyes, reproductive organs and human breast milk. ALA, the shorter chain fatty acid is also partially turned into the longer chain EPA and DHA, which are called conditional essential fatty acids. The other essential fatty acid is omega-6 or alpha linoleic acid, LA. Is is very similar structurally and is also essential for health, maintaining healthy cells and immune system. But the function of omega-6 is mainly inflammatory and almost opposite that of omega-3. Omega-6 comes from most of the vegetable oils we eat, especially sunflower, corn oil and even olive oil. The average western diet tends to get far too much omega-6. 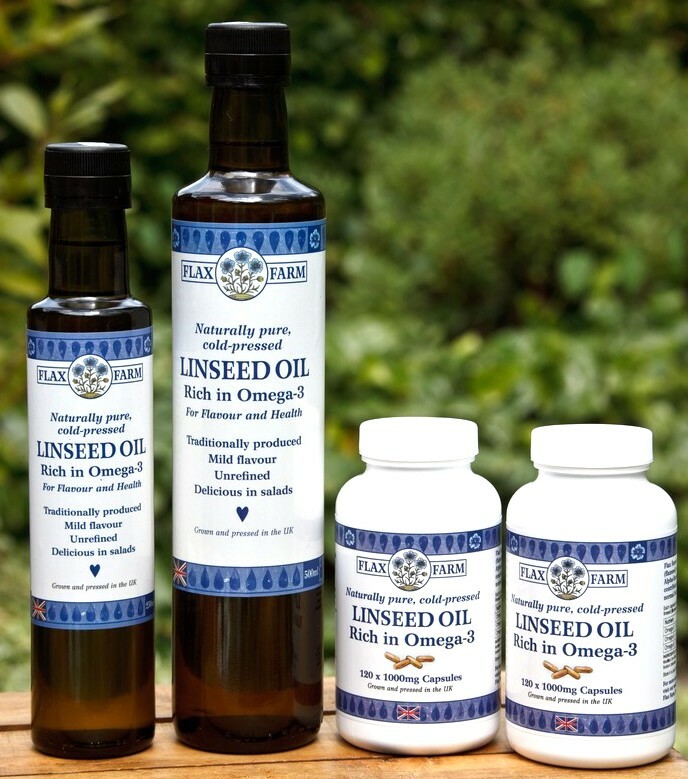 Linseed oil contains only a little omega-6 useful as part of a balanced diet. Omega-9, oleic acid is structurally similar to omega-3 and 6 being an 18 carbon chain but is only monounsaturated, meaning it only has one double bond and is not an essential fat as the body makes it easily when it needs it; it is extremely common in our diets and occurs in almost every other vegetable and animal oils and fats. Omega-9 is most commonly associated with olive oil from which it gets its name oleic acid. Olive oil, rapeseed oil and other sources of omega-9 are almost always associated with a percentage of omega-6 but these oils contain no omega-3 or too much imbalance of omega-6. In addition high levels of these oils reduces how efficiently we metabolise omega-3. Omega-3 is the good fat we all tend to be short of which is why increasing the omega in your diet can be amazing. How to use linseed get enough omega-3? Flax Farm cold-pressed linseed oil at around 60% omega-3 is the richest source of omega-3. Our freshly bottled. unprocessed linseed oil is a light-tasting, versatile salad oil. Flax Farm cold-pressed linseed oil capsules contain the same oil and high omega-3 and are a convenient way for busy people to get their omega-3. So if you don’t like fish try some of our lovely cold-pressed linseed oil drizzled added to your food. Getting enough omega-3 in the diet is as easy as adding a daily helping of from 1 teaspoon to as much as 1-2 tablespoons of Flax Farm linseed oil to food, ½ teaspoon for children or ¼ teaspoon for toddlers. Or even more as recommended by special diets or practitioners. Another good useful source of easily digested omega-3. 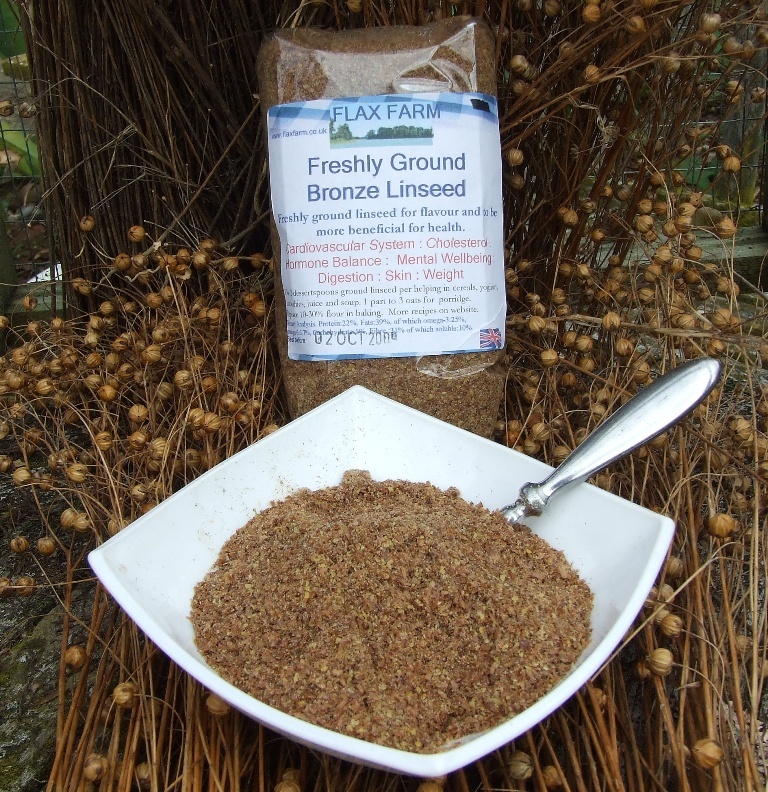 Both ground gold and bronze varieties of linseed provide similar quantities of omega-3. 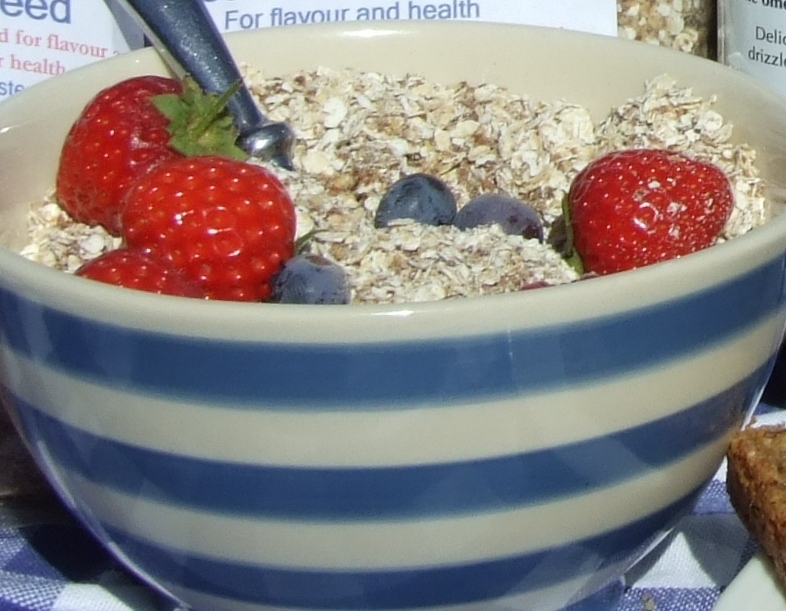 Instead of your normal breakfast or snack try Flax Farm linseed porridge, muesli and Flaxjacks® as a great way get the benefits of omega-3 into your diet. 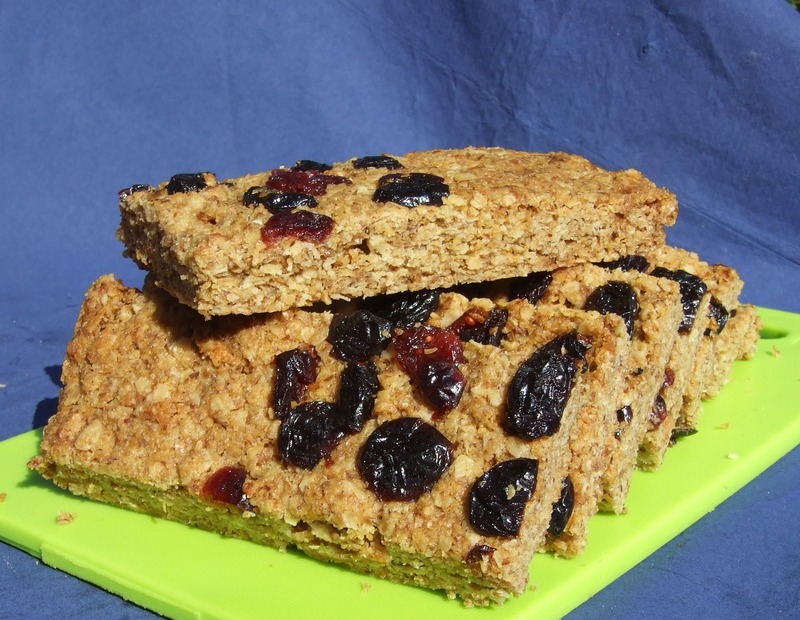 Our Flaxjacks are also a good source of omega-3.